On the whole the teams seemed to enjoy what was served up. The first half à la Stockport exemplified the crisp 'what? who? where?' style that is the hallmark of a good Stockport paper. The second half of WithQuizzery delved into 'why? how?' territory with a more cryptic format to the questions. As a result part two was about twice the length in terms of time taken but still plenty enjoyable. "An enjoyable and accessible paper; the cricketers theme was very well disguised". 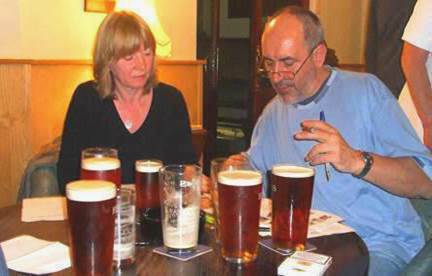 "All agreed that tonight's quiz was a great season opener. The 'what happened' picture round was round of the week." "Very inventive quiz from the Opsimaths - not the points bonanza that some Opsi's papers have been in recent years but some very clever themes." "...a good quiz, especially the Dame Edna opening round." "...and sadly even the enjoyment factor occasionally seen in quizzes where one hasn't the slightest idea of any of the answers was absent." "A very high aggregate score of 83 and only 7 unanswered questions attests to a very well judged paper full of variety and interest. The Lancashire cricketers theme was good and we thought the Monopoly values idea was excellent though the second part of the pair was bound to be easier than the first." "As usual another very cleverly crafted quiz from TMTCH. We loved rounds 4 & 5 and wondered how long it took TMTCH to put it all together." "Great, inventive paper from The Men, easily the best of the season so far." "Tonight's quiz from the Meat Raffle was a very erudite and wordy affair. We thought it a little on the difficult side as indicated by the rather low score." "Quiz well received tonight. The CMR have certainly compiled a quiz that satisfies all the criteria of our league: novelty, erudition and a fair sprinkling of teasers whilst still pandering to our more demanding requirements (e.g. no pop questions after 1985). The tricks and treats were well executed." A typical Charas paper full of variety with more than a tinge of green running through the core (thank goodness for the Opsimaths' new recruit, Paddy). Not as high scoring as recent Charas papers but nonetheless enjoyable. "The unanimous verdict was that it was an excellent paper and that Bertrand Russell was far too much of a smart arse." At the Traveller's Call the home team were truly gobsmacked at the thought and skill that had clearly gone into the compilation. The QM specifically asked me to convey a warm thank you to Dave on his team's behalf. "Quiz well received. Dave Barras certainly displayed his usual breadth, depth and invention. Questions a bit on the hard side." "With a combined score of 61, and 15 unanswereds, this was quite a tricky paper." "Very good quiz from The Albert." "We found a fair bit to enjoy in the paper but did get a little hung up on Round 6." "The Movember round and the Nerdy Round vied for top 'fun spot'." "We found the paper hard, but so what, papers shouldn't be of uniform quality and even some imbalance adds to the interest." "Well done to the Prodigals in producing another excellent test." "The best sort of quiz, where if you don't know the answer you can't wait to find out!" "There were plenty of questions to our taste - and to the Chara's taste as well. I think the only gripe was that some of the pairs seemed a bit skew-whiff in terms of evenness. I'm happy to report that by and large the Opsimaths had the skew and the Charas had the whiff." "Another good paper with plaudits from most quarters. Perhaps slightly more accessible than your usual Ethel offering." "So much to learn about what it was like in our grandparents' day" was the comment from the Meat Raffle youngsters. "Excellent, accessible Bards quiz, not too easy nor too dull and boring - just right. And it produced a splendid game with the result in doubt right up to the last few questions." "As the score indicates a difficult quiz for us but with many interesting questions and cunning pairings." "Tonight's fare from the guys who have never been to one was an excellent curtain raiser to the second half of the season and proved just the ticket to banish the post-Christmas-start-of-January blues." "The questions were very well received. Needless to say the themes did not declare themselves until nearly the end of the rounds concerned (and in the birthday round not at all)." The scores were universally low and - however interesting some of the material might have been - this made for some dull evenings around Didsbury and Withington. "The verdict on the quiz was mixed. Round 5 Questions 1 and 2 (about the Formula One father and son drivers) was a stand out mismatched pair. Some thought the quiz hard, some obscure." The overall sense coming back from the match reports has been of hard work. "Well a trip back in time by a decade or so to the days when Wednesday quiz papers would routinely be greeted with a groan about ungettable questions." "A good quiz with lots of variety, though the train theme left us all stumped, even after it was revealed and a couple of the questions could have been less ambiguously worded. I particularly liked the Toad of Toad Hall question." As you can probably gather from the match reports TMTCH's paper promised much and delivered much. In fact - if it's possible - more than much. "Excellent quiz from TMTCH just as we have come to expect. Only six unanswered questions." "Undoubtedly the genius moment when the Men realised that 'Orla board' would fit their theme perfectly. There's some fiendish setting skill and mischief in the slightly warped mind that came up with that one." "The best aspect of the paper for me, however, lay in the themes - especially those deployed in Rounds 2 and 6." "Downside? Well it wouldn't be a CMR paper without a bit of contemporary music material from Rachael, our resident record label entrepreneur." "Quiz itself moderately hard but agreement all round that the questions were interesting." "An excellent well-constructed paper was enjoyed by all." "From the QM chair it seemed to me a very good quiz - with very few unanswered questions." "A typically fine Charas paper. We detected the hand of Fr. Megson all over the place. Could probably have done without quite so much Gaelic football and Hurling." "As might be expected for a Euro semi final the questions (as far as we were concerned) proved somewhat testing." "...quite liked tonight’s quiz though with only six 2s per side, it was paper dominated by informed (and sometimes highly speculative) discussion." "After a couple of weeks of excellent Charas papers this one was definitely not to our taste." Of all of our teams the Prodigals tend to be the most experimental with their setting. They like to push the boundaries and see if they can come up with new ideas for round formats. Indeed were it not for this spirit of inventiveness our Wednesday evenings would still be stuck in the 'What's the capital of Albania?' mode that characterised the early years of the Withington Quiz League. "Very enjoyable quiz and the themes went down a treat. Never knew there were so many '-esques' and capital cities short enough to sneak into a word." "An excellent compilation ending with, what is becoming a fairly regular feature, a couple of 'Pick Your Own Subject' rounds. The real quality though lay in the crafting of the questions themselves and the feeling at the Club was that the History Men authors had done a first rate job weaving intriguingly worded questions out of the material at hand." "We thoroughly enjoyed tonight's paper." Not an easy paper but certainly a fair one with close results and a good balance on the unanswerables. "We found some of the early rounds a tad obscure with a great deal of 'Oh, really, well I never knew that!' type reactions from both of teams leading to the corollary that we probably wouldn't remember the answers anyway. I just love being QM when it's one of Dave's papers. The desire to stop and chat about pretty well every question is very strong. Thirteenth most populous country? Well who'd have thought that? How on earth do they work out that that square is the second most visited square on the Monopoly Board? How can an Asteroid make you smell a location? Da-da-dada-da-dadada, da-da-dada-da-dadada!! Opening line of a Shakespeare play in the Sun? Surely not? Mallard, Beano, the North face of the Eiger and Bill Shankly in common? Must be that they're all shining examples of Dave's ladhood obsessions? "As always a very good set of questions from TMTCH and most with an alternative route in to an answer if we thought long enough - and because we did think long enough it led to a late-ish finish." A toughie but, as ever, some excellent material from Roddy and his crew. The average aggregate score across the grounds was pretty low. "With a combined uncorrected score of 61 it was a typical hard quiz from Ethel Rodin." Spot on for an evening's quizzing late in the season's calendar! "Tonight's questions from INBTO just played nicely to our strengths." At the end of the evening after a few hurried conflabs all four finalist teams opted for The Opsimaths' Round 3 (K-A-T for C-A-T) as their round of the night. This was a 'toughie' and the average aggregate score of 77.0 (across the A-Trophy final a fortnight ago and tonight's match) was well down on the previous WIST matches this season. As is usual the subject matter dealt with in the paper spoke volumes about the respective interests and hobbies of the two setters - so planes, boats and trains (but no tanks this time round) from Dave and plenty of football, TV, Scotland and geography generally from me. Mike Wagstaffe from the Alexandra team in the Stockport League set an excellent 100-question 4-round quiz to get us all off on our summer quiz sabbatical.